Jurassic Park: Fallen Kingdom Review | Tired, stupid and ugly. "Jurassic World: Fallen Kingdom, by contrast, flaunts flawed computer imagery that engenders detachment." "The problem is that there is no natural progression to Spielberg's original..."
Many years ago, some time after the release of Joe Johnston’s Jurassic Park 3 and many years before Colin Treverrow’s Jurassic World, I can recall reading a number of articles regarding the future of the franchise, a franchise that was never designed with enfranchisement in mind. Dinosaurs with lazers attached to their heads, trained as mercenaries, more than one of these articles, all from reliable publications, announced. It was as though Doctor Evil had appropriated the control of Hollywood’s think tank overnight. If the concept sounds as nonsensical to you as it did to me back then, the sad news for both of us is that Jurassic World: Fallen Kingdom is almost that movie. A quick side note – Chris Pratt‘s Owen and Bryce Dallas Howard‘s Claire must surely be two of the more frustrating protagonists in recent cinema in the sense that their presence is justified tenuously and it also leads to worse outcomes than their absence would have. A curious aspect of Jurassic Park: Fallen Kingdom is that there is something to be said for the villains being allowed to go about their business. Flawed heroes can make for compelling filmmaking, but the filmmaking needs to be compelling for it to work. Beyond being an example of well-crafted mindless entertainment, consequently a benchmark you can point to when fellow audience members defend sub par entertainment filmmaking, the original Jurassic Park is notable for two crucial ingredients. The first is its use of computer generated imagery, which remains one of the most impressive examples of the manipulation of that particular filmmaking tool. CGI was still in its infancy in 1993 but Spielberg was persuaded to concede that puppetry and practical special effects wouldn’t suffice in the realisation of his imagination. His adoption of CGI was considered, which is why the images in Jurassic Park that were intended to inspire awe still inspire awe. Jurassic World: Fallen Kingdom, by contrast, flaunts flawed, thoughtless, computer imagery that engenders detachment. Because of two and a half decades of misuse of the tool, audiences are acutely aware of the presence of CGI. That we not only know the T-Rex in Fallen Kingdom isn’t real but know how it was created is a giant leap from our dissimilar first impressions of the same creature in Jurassic Park. The second ingredient for which Jurassic Park is notable is Spielberg, which may initially appear like a redundant assertion until you consider Spielberg’s work in Jurassic Park in contrast to his many lesser efforts. I have mentioned the scene in the rain in which the T-Rex first attacks in articles and reviews before. It is one of the finest examples of Spielberg as a constitutional storyteller. Crucial to that scene is everything leading up to it. Spielberg’s grasp on pace, character, mood and his artistry in foreshadowing that iconic arrival of the T-Rex, a decisive herald of the dangers of a theme park like John Hammond’s, is exactly why you should never listen to anyone defending shoddy blockbuster filmmaking, of which most blockbusters are examples, by contending that they just want to be entertained. Poorly constructed entertainment is the norm, and it shouldn’t be. 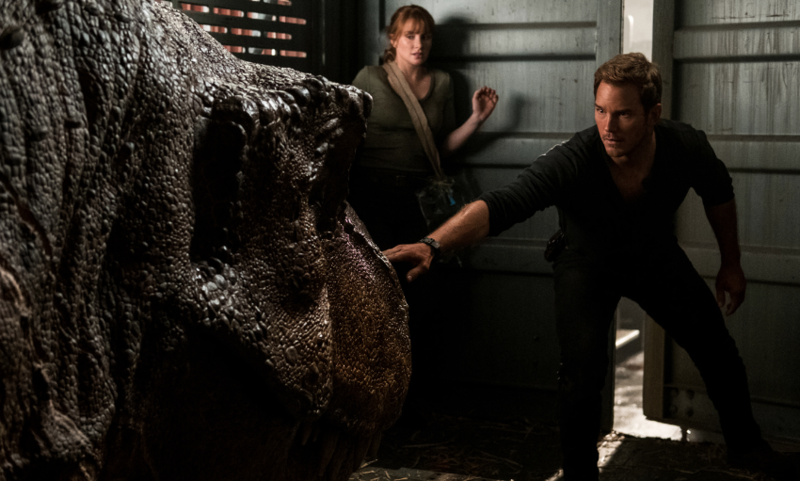 Jurassic World: Fallen Kingdom bears no semblance to the original in this regard, or any regard other than a handful of superficial similarities…like dinosaurs and Jeff Goldblum. In lieu of Spielberg’s measured, accumulating storytelling, director J.A. Bayona blends a sloppy mess of nonsense that ought to have been left on Doctor Evil’s drawing board, or in the mind of a long-ago fired Universal executive. I won’t bother detailing how silly Fallen Kingdom can get because the work has already been done for me. The problem is that there is no natural progression to Spielberg’s original, there never has been, something that every subsequent Jurassic Park film has failed to realise on their path to inconsequentiality. It’s why the dino-lazer screenplay was written (by John Sayles, I wasn’t kidding before, look it up) and it’s why Jurassic World: Fallen Kingdom adopts a ethos of MORE and BIGGER. Bigger isn’t better, better is better and sometimes just nothing is better. 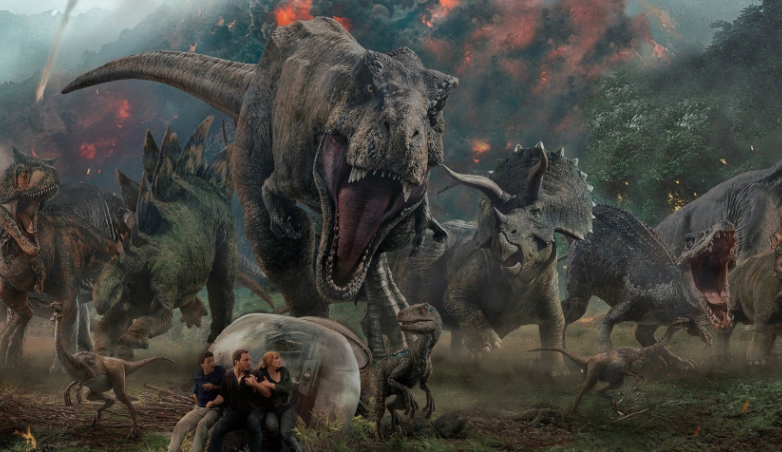 Nowadays, it seems, a Jurassic Park movie is whatever it wants to be. 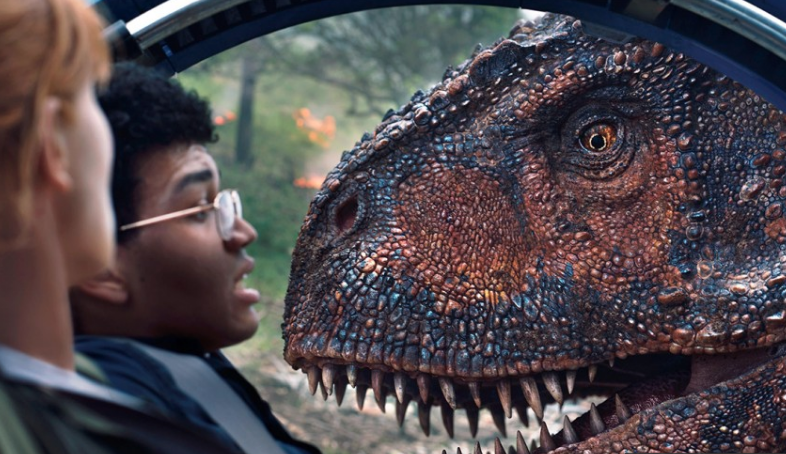 ”[Jurassic World 3] is a movie I’ve wanted to see my whole life, and I knew it would take two movies to earn it and to get there,” writer-producer Colin Trevorrow recently told Uproxx. Treverrow directed the first Jurassic World film and his input here, and elsewhere, suggests his career to date has been the offshoot of blind luck. Regrettably, it seems as though Treverrow, who has done little to earn it, will probably get to realise his dream.